But more than anything the issue which is being raised by Japan is one of confidence, and one of how we think about risk (an issue which has been lurking in the background without being resolved since the start of the financial crisis). Problems in evaluating risk and shocks to confidence levels are hardly good for risk sentiment, and it is an increasein this sentiment which is, at the end of the day, giving momentum to the current expansion in global economic activity. And of course risk-negative phenomena are not only to be found in Japan, a fact of which this weekend’s opening of military engagements in Libya is just one more painful reminder. The whole of the last week has been characterised by a high level of uncertainty, with oil prices remaining extremely volatile and sharp movements in the value of the yen having such a negative influence on currency markets that the G7 felt itself forced to step in. So while the external economic damage seems at the present to have been contained, with one â€œbad luckâ€ event after another taking place the momentum behind the current recovery is surely coming under a lot of pressure, and all prudent analysts will doubtless be busy revising downwards their growth forecasts for the second half of the year across the board. Japan has provided us with one very good example of this. Towards the end of last year the Japanese economy had been going through what is euphemistically called a “soft patch” – the economy actually contracted in the last three months of the year – but in January and February there did seem to be signs that things were getting better, and one guage of small-business sentiment (the Economy Watchers Index) had even started to surge. Serious as the short term impacts may well be, in the longer run the shadow which will be cast by what is currently happening in Japan could well be very long indeed, in a way which few today can even contemplate (although see this for a good first pass). 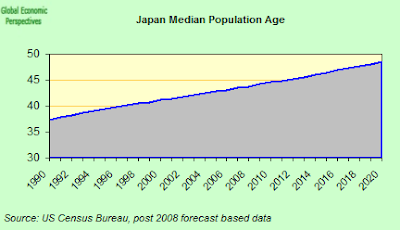 The justification for this assertion is not only our increased awareness of our collective vulnerability to the impact of natural disasters, there is also Japanâ€™s pioneer status in one very new and very global phenomenon – population ageing – to think about. 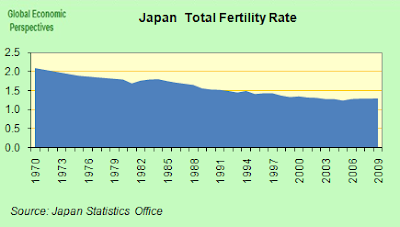 As we will see below, the optimistic (I would say denial) prognosis is that Japan will soon valiantly overcome this latest bout of adversity in a similar way to which they overcame the post WWII devastation. The Japanese will surely be valiant in their efforts (one only has to think of the spirit of sacrificeof those poor workers who have been asked to handle directly the reactor problem), but their ability to overcome adversity will not be comparable to that registered in an earlier epoch when they had the wind behind them rather than gusting straight into their faces. So while the initial impact will surely constitute what most traditional economists like to call a â€œshockâ€, both to the real economy and to the equity and currency markets, this shock is unlikely to knock either the global or the local economy completely off their orbits in the short run. We are not talking (barring that worst case scenario that we all have our fingers tightly crossed wonâ€™t happen) about another Lehman type event. We are talking about a major natural disaster in a country with proven response ability. 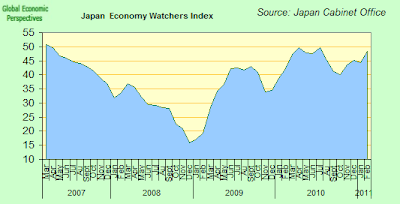 Even if Japan is currently now back in recession, rebuilding will almost certainly mean the local economy bounces back quickly again in the second half of the year. The longer run effects, however, will almost certainly be much more important. 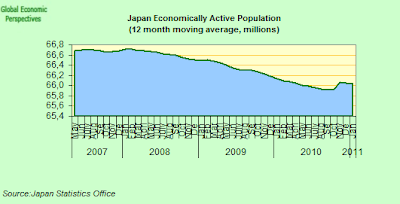 On one front the impact may well be to cast a much larger and more intense spotlight on the Japanese economy itself, with increasing questions being asked about the sustainability of its current path giving the declining and ageing population issues which confront it. And on another front, the events of the last week may well end up changing our way of thinking about the world we live in, and how we manage risk and insecurity. One week ago few would have imagined it was possible for a developed country to find itself spinning-off out of control, now the previously “unthinkable” is certainly a lot more thinkable. At The End Of The Day Isnâ€™t There Something “Funny” About Japan? Japanâ€™s economy is totally export-dependent, riddled with deflation, has central bank interest rates pegged almost permanently close to zero, while government debt seems to be on a virtually unstoppable upward path. Just to give some idea, IMF Japan projections are for GDP growth of around 1.75% a year between now and 2015. During the same period the government debt to GDP level will rise from 225.8% in 2010, to 234% in 2011 and then onwards and upwards to 249.2% in 2015 – that is the debt is rising at over 5% of GDP a year, while GDP is growing at under 2%. Personally I’m surprised that more people don’t think there is something funny about these numbers, especially in the context of ongoing deflation and massive liquidity provision from the central bank. According to one widely held theory, none of the above matters too much since Japanâ€™s government debt is financed from domestic saving. On this view having near permanent deflation seems to be a massive positive, since it enables money to be printed and debt to be accumulated on a never-ending basis. The perpetual motion machine has finally been invented, and is alive and well and living in Japan. Certainly the situation has all the appearance of permanence, since it would now seem to be virtually impossible for the Bank of Japan to move into reverse gear and raise benchmark rates to what was in earlier days a “normal” level of 5% since how would the government continue to finance itself, whether the savings are domestic or external? 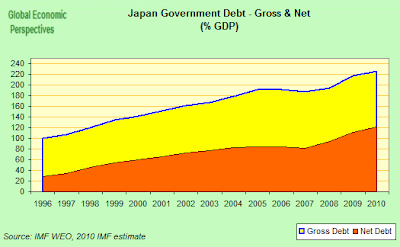 And of course, if at some point Japan did come to depend on external funding, and interest rates were forced up to 5% or more………..
On another version of events, the gross debt argument (gross debt is used simply to be able to make a comparison with other countries, such as members of the EU, where it is gross debt that is measured and quoted) is misleading, since Japan’s government also has assets (like land which was acquired during the bank restructuring of the 1990s), and it is the net debt level we should be looking at. I have two responses to this objection. In the first place, the argument fails to take into account the implicit liabilities of the Japanese pension and social security systems. Once this is done you have a number which while still being lower than the gross debt figure is consideably above the hypothetical level of net savings. In the second place, while the values of the Japan government’s gross liabilities to its creditors are known and quantifiable, it is much harder to put mark-to-market numbers on the assets being held. Evidently what we have here is a clear example of something which only goes on until the day it doesnâ€™t. The underlying problem in Japan is not lack of technical ingenuity, nor is it a shortage of credit; Japanâ€™s fundamental problem is a demographic one. The country has a rapidly ageing population, which after many years of ultra-low fertility and rising life expectancy is now the oldest in the planet, with a median age of 45 and rising. This is the backdrop to all these weird and wonderful economic phenomena we are observing, and is the root cause of the weak domestic demand, and of the ultra-sensitivity of the economy to movements in the external trade balance. Japanâ€™s Prime Minister Naoto Kan has already stated that Japan is now facing its worst crisis since the end of World War II, and I think it is hard to disagree with this assessment, both in the context of the current â€œfacts on the groundâ€ and given the major challenge the country faces on the demographic front. 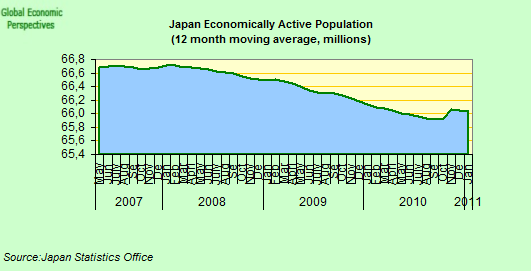 This is what the consensus view which holds Japan is likely to suffer a temporary economic hit and then enjoy a boost from reconstruction seems to be missing. Japan is very unlikely to have a â€œNew Deal” like economic recovery, for the simple reason that it cannot really afford to have one due to the pressing need to get the debt dynamics better under control. Not least of the reasons for such caution will be the growing vigilance the countryâ€™s debt is attracting from the rating agencies. Standard & Poorâ€™s cut their Japan rating in January, and while Moodyâ€™s have been quick to point out that the current crisis will not affect their analysis, they did change their Japan rating outlook to negative from stable at the end of February on concern that the countryâ€™s political gridlock will limit efforts to tackle the debt burden. These concerns will only be heightened in the aftermath of recent events. According to Marcus Noland, deputy director of the Peterson Institute for International Economics in Washington what Japan is facing â€œis a Keynesian stimulus program that nobody can argue withâ€. Unfortunately, this is far from being the case, Japan is at the end and not the start of its “modern growth era” and any attempt to finance a massive reconstruction programme by issuing yet more debt is likely to provoke just what Noland discounts: a lot of argument. Funny how so many people still fail to find anything â€œfunnyâ€ about what has been happening in Japan. This entry was posted in A Fistful Of Euros, Culture, Economics and demography, Economics: Country briefings, Economics: Currencies, Energy and enviroment by Edward Hugh. Bookmark the permalink. So Japan’s government cannot borrow more to come up with a large fiscal stimulus package and then there is this ugly deflation problem…there is really nothing they can do, right? Someone once told me this mythical story about a thing called “monetary policy”. Allegedly, any modern macroeconomic theory designates it as the first-best policy tool. But that cannot be true, right? Because if such a thing existed we would not be writing long essays about the malaise of not being able to do more fiscal stimulus and instead focus on “monetary policy”. Could it be that the Bank of Japan tries really hard to get inflation but simply cannot? That can’t be true, given that they tightened monetary policy in 2006 when inflation was still below 1%. Nothing funny, then. Nothing funny at all, here. Actually “not funny any more”, Japan only was able to tighten in 2006 by 0.25% (from zero to 0.25%), and then had to call an urgent halt. And indeed core inflation was still in negative territory (ie it never rose above zero). Unfortunately the textbooks are now out of date, and neither monetary policy nor fiscal policy can really help unless they address their demographic issue. Keeping pumping into their monetary black hole is only the economic equivalent of trying to resolve their nuclear issue by pumping seawater into the reactors. What is it they called it – the “hail mary pass”? And, not incidentally, a question that most “serious” macroeconomists seem equally unwilling to entertain is: “Why should a country already straining to accommodate the needs of a population of 127 Million in a physical area smaller than California consider population decline to be anything but a long-term boon?” There is a reason they had to build light-water reactors in the middle of a known earthquake/tsunami zone, and it’s not because of a cultural love for radioactivity. One can always count on Edward as prophet of Doom. What a grey existence this fellow lives! After months of not coming here to talk about Spain and being proved wrong once and again, we could be sure he would appear after a natural catastrophe somewhere, anywhere. 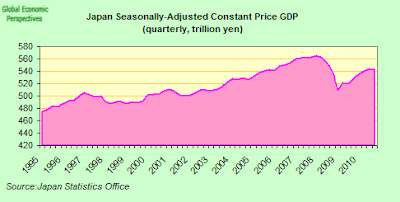 So suddenly Japan has an immense demand to fulfil, just to reconstruct all the damage caused by the earthquake, the sunami and the nuclear meltdown, and again Edward has not heard of demand-side economics and its effect on growth. 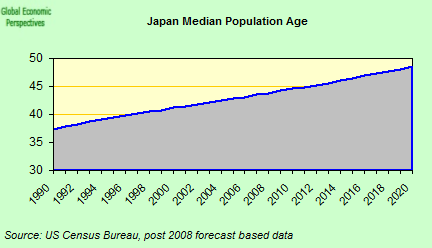 What for Spain is a problem: massive youth unemployment and spare capacity, which Edward paints as a migration drama (which actually does not exist) apparently should be a blessing for Japan, or so could be understood from his words regarding Japan population ageing. Well it isn’t, he says. With Edwards one always knows that one thing and the opposite are always bad if not terrible, no matter what are we talking about. @DoctorMemory. The reasond they build nuclear reactors is not a cultural love for radioactivity but rather a cultural love for technology. They do sell nuclear plants of their own design to other countries as well. Hopefully, and almost certainly, they will turn to other cleaner technologies to provide energy for their well heeled, comfortably living, ageing population. The solution is theoretically pretty easy, although it may be politically very difficult – as long as the world is in the midst of craze of inelastic economic dogma. 1. Raise marginal income/inheritance tax rates. 2. Raise tax rates on capital gains. 3. Increase expenditure to reform its geographical structure, especially against motorisation and urban sprawl in addition to the reconstruction of Tohoku region. 4. Amend the 1997 Antitrust Law and dissolve holding companies. I)	Reconstruct the public finances. II)	Reduce the income velocity of money and liquidity preference. IV)	Foster the system of indirect finance again. V)	Shift the flow of the money supply (i.e. M=Y/V+L(r)) from the speculation (i.e. L(r)) into the production (Y/V) to increase the real wages to improve the population dynamics. Or Japan could just stop issuing debt to cover fiscal deficits. There is no economic reason why they couldn’t do this. I do remember reading Mr Wolfâ€™s whim last year. Iâ€™ll tell you what: Both the Hayekian policy and Neoclassical-Keynesian Synthesis policy are the worst of any thinkable. They overlook fixed factors of production and thus income velocity of money and thus the liquidity preference. The former will aggravate deflation while the latter will cause semi-inflation. In both cases speculative activities will be encouraged at the cost of the domestic fixed-capital accumulation. In other words, those policies will simply ruin Japan. Mister Hugh, you often refer to the problem of aging populations. Apparently, if more people are old and thus live on retirement while less people are young and working htere should be a shortage of labor and a consequent inflation in wages; we are living the opposite scenario. My opinion is that there is a reverse causation between aging populations and lower economic growth: in many economies, like in Japan or in Italy where I live, low production growth coupled with rising living standard and growing living expenses made exceedingly expensive for lower and middle class families to have children (for example in Italy if you have a son today you are almost sure that he’ll not be self sufficient before his ’30s), thus discouraging births, thus leading to older populations on average. In 1755? When Isaac Newton had already been dead for thirty years? I think the “natural order of things” had been questioned to within an inch of its life by 1755. The rest of the column is pretty good, but I think you are stretching way too hard to squeeze a great significance out of Lisbon. To parody Freud, sometimes an earthquake is just an earthquake.